1.1 This specification2 covers wrought carbon steel and alloy steel fittings of seamless and welded construction, covered by the latest revision of ASME B16.9, ASME B16.11, MSS SP-79, MSS SP-83, MSS SP-95, and MSS SP-97. 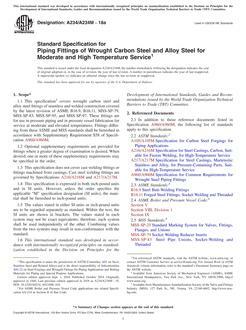 Fittings differing from these ASME and MSS standards shall be furnished in accordance with Supplementary Requirement S58 of Specification A960/A960M. These fittings are for use in pressure piping and pressure vessel service at low temperatures.